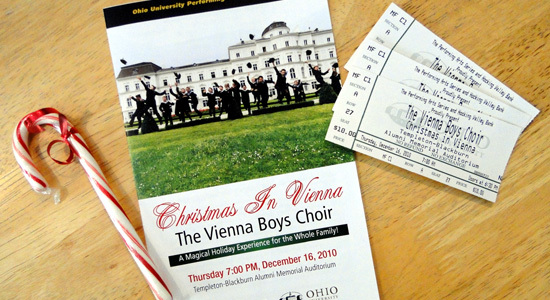 Tonight Mom, Sarah and I attended the performance of Christmas in Vienna by The Vienna Boys Choir at Templeton-Blackburn Alumni Memorial Auditorium at Ohio University. The group of about two-dozen boys, ages ten to fourteen, performed beautifully, along with their choirmaster accompanying them on piano on about half of the numbers. Most songs were sand in German, while only a couple was in English. The choirmaster spoke to the crowd, introducing songs, telling some of the history of the choir and a few jokes as well. For one number we were asked to join the choir by clapping long with an Austrian folk song. Now we can all say that we have performed with the Vienna Boys Choir. Halley's Comet is visible from Earth every seventy-five to seventy-six years. It has been one hundred and two years since the Chicago Cubs have one the World Series. Now, after five hundred and twelve years, the Vienna Boys Choir finally has performed in Athens. And I was there.